It is currently not possible to determine which of the bacterial groups is the oldest geologically. Of the earliest microfossils known to date, all are morphologically simple and at least some were probably phototactic. Early microbiotas contained both anaerobes and photoautotrophs (Knoll, 1985a). In 1966, Barghoorn and Schopf described small rod-shaped cells from the Onverwacht Group of South Africa (3.5 Ga ago) under the name Eobacterium. Although originally thought to represent rod-shaped bacteria based on transmission electron microscopy (TEM), these structures are now regarded as non-fossil or modern bacterial contaminants (Schopf and Walter, 1983). Research with modern bacteria growing in hot springs environments is providing information about how bacteria are preserved, which in turn will aid paleobotanists in their interpretation of fossil microbes (Phoenix et al., 2005), as many ancient hot springs environments resulted in structurally preserved bacterial fossils. Bacteria from the Early Devonian Rhynie chert hot springs environment have been described as both spherical clusters and as unicells. Some of these structures appear similar to bacteria-like organisms (BLOs) that have been described inside the spores of some modern mycorrhizal fungi (Bonfante, 2003; Taylor et al., 2004; Duponnois and Kisa, 2006). Bacteria have also been reported in permineralized plants and coprolites of Carboniferous and Permian age (Renault, 1901) as circular-to-elongate structures <4pm in diameter (FIG. 3.113). 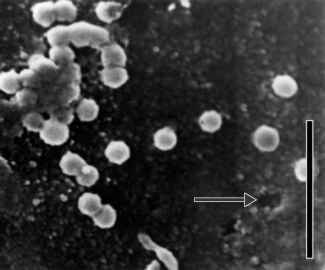 These were named Micrococcus and Bacillus, but some of them represent inorganic particles of various types (Taylor and Krings, 2005). Fossil iron bacteria have been found in pyrite from Middle Pennsylvanian rocks and examined by means of replication techniques for TEM (Schopf et al., 1965). The morphological similarity between the fossil and extant types resulted in some of these fossils being assigned to modern taxa. Bacteria have also been suggested as the causal agent for various borings in vesicles of Ordovician chitinozoans (Grahn, 1981). wood rot have not been identified either directly or indirectly in these fossil woods. Fossil woods, however, offer potential for future research on both the bacteria and their interrelationships with fungi during the decay process. Actinomycetes are a type of filamentous, Gram-positive bacteria. Actinomycetes have been reported from Eocene amber (Waggoner, 1994), a Carboniferous seed plant cell (Smoot and Taylor, 1983a), and Eocene dicot wood (Wilkinson, 2003). Although some of these reports suggest that the fossils are actinomycetes based on morphological features, some may represent modern contaminants or coagulated cytoplasm. One method that has been used to indicate that these organisms are fossils is the presence of the filaments growing through the crystals in the wood cells (Wilkinson, 2003). Leptotrichites is a sheathed bacterium from Cretaceous amber that resembles the modern genus Leptothrix (Schmidt and Schäfer, 2005). The fossil forms are interpreted as living in ponds in forest woodlands and became entrapped in amber flowing from the trees. Various forms of bacteria, including forms suggestive of sulfate-reducing bacteria and several types associated with decomposition, have been reported from the Eocene Green River Formation (Mason, 2005). microbes were extremely specific, attacking only certain layers of the pollen grain wall (Elsik, 1970). Such occurrences have been documented as early as the Carboniferous, where coccoid and bacilloid microbes were found on the surface of miospores (FIG. 3.114 ) . Instances of fossil bacterial degradation patterns are probably far more common than reported, since palynologists typically search out only well-preserved sporomorphs showing a complement of diagnostic features. This inherent bias toward well-preserved specimens probably eliminates the documentation of more examples of micro-bial degradation. However, with organisms that are as small as prokaryotes, there is always the possibility of ascribing biotic properties to abiotic artifacts. A case in point involves the description of unmineralized fossil (Cretaceous) bacteria associated with scraps of organic material in lake muds. Upon reexamination, these bacteria turned out to be fluorite artifacts formed during the maceration process (Bradley, 1968). There are other potential sources of confusion regarding the authenticity of fossil bacteria, for example tapetal cell components, such as orbicules produced during microsporo-genesis in certain plants, have been mistaken for coccoid bacteria. Due to the ubiquity of bacteria in the modern world, there is always the problem of specimen contamination. For example, it has been reported that fossil bacteria could be isolated and grown from Permian salt deposits (~250Ma) (Dombrowski, 1963; Vreeland et al., 2000; Satterfield et al., 2005). Others suggest that the organisms represent modern contaminants formed during the recrystallization of the salt. It has been noted by several authors that DNA decays quickly, and that no metabolic processes of any organisms could survive for so long. Several analyses have suggested that these bacteria are too similar genetically to modern taxa, so evolution would have to be extremely slow in these organisms (Nickle et al., 2002) and that bacterial spores, which can survive for long periods of time, generally have no DNA repair enzymes within them, so DNA this ancient would have been very fragmented (Graur and Pupko, 2001). The problem of modern bacterial contamination and the formation of bacteria-like artifacts during certain types of paleobotanical techniques is discussed by Edwards et al. (2006a) . These studies elegantly underscore that, in dealing with fossil organisms, the pervasive distribution of microbes now and in the past can impact research results at several levels of inquiry. 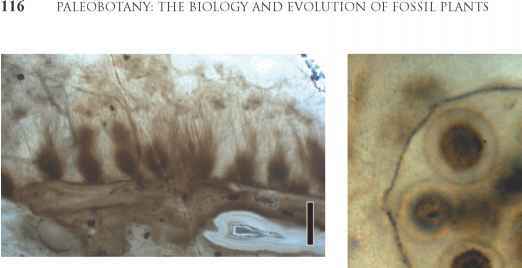 The complexity of the fossilization process and subsequent diagenesis, the procedures used in sample extraction and preparation, and the establishment of biogenicity all must be considered in the analysis of microbial fossils. For example, rod-shaped bacteria, together with certain types of organic compounds (polycyclic aromatic hydrocarbons), were described from a Martian meteorite collected in Antarctica (McKay et al., 1996). Subsequent research has suggested that the "microbes" are in fact the result of certain preparation techniques, and/or contaminants from melt water. What does the future hold for the study of extraterrestrial life based on fossil evidence? One approach will require the cataloging of various types of biosignatures in all forms of sediments, including how modern microbes can change the potential signature (Cady et al., 2003). The cyanobacteria are the most common and widespread group of photosynthetic bacteria today, and are the primary producers and initial source of free atmospheric oxygen. Their fossil record is among the oldest for any group of organisms, and can be traced back to the Archean (Golubic and Seong-Joo, 1999; Chapter 2). Combining fossil evidence with molecular data of living cyanobacteria has made it possible to hypothesize that cell differentiation (e.g., heterocysts and akinetes) occurred in this group as early as 2.450 Ga (Tomitani et al., 2006). Heterocysts are thick-walled cells where anaerobic nitrogen fixation occurs and akinetes are resting spores. What is especially interesting is that, when modern and fossil cyanobacterial communities are compared, the data suggest that there has been relatively little morphological and probably biochemical change during more than 2 billion years of Earth history (Knoll, 1985a; Sergeev et al., 2002). Among the other bacteria, the Cyanobacteria appear to be most closely related to Gram-positive bacteria, based on molecular signatures. Cyanobacteria obtain their energy through photosynthesis and occur as unicellular, colonial and filamentous forms. They all contain chlorophyll a and accessory pigments in the form of phycobilins. Most cyano-bacteria possess a mucilaginous sheath, which may be variously pigmented. Many of these ancient organisms have the ability to fix atmospheric nitrogen and, combined with their photosynthetic abilities, are thus the most nutritionally autonomous organisms on the Earth. 1988). Although present throughout geologic time, cyano-bacteria are a dominant component of many Precambrian biotas discussed in Chapter 2; a few additional examples of geologically younger cyanobacteria will be presented here. 1989). The identification of the heavy sulfur isotope has also been proposed as a useful tool in determining past environmental conditions and as a stratigraphic marker at the Neoproterozoic-Cambrian boundary (Schroder et al., 2004). However, bacteriogenic sulfide patterns are also regarded as difficult to identify earlier than about 2.8 Ga. As a result, it is currently impossible to determine whether some of the geologically early sulfides were the result of sulfate-reducing organisms or were inorganically formed, that is they are abiotic in origin. Activities of cyanobacteria in the fossil record can also be examined by the presence of various biomarkers in the sediments. Molecular fossils in the form of biological lipids have been recovered from 2.7 Ga shales in Australia (Brocks et al., 1999), and in slightly younger rocks from Canada. Akinetes have been reported from ~2.1 Ga cherts from Gabon, Africa (Amard and Bertrand-Sarfati, 1997), and slightly younger ones from Siberian cherts that are morphologically identical to those produced by the living cyanobacterium Anabaena. 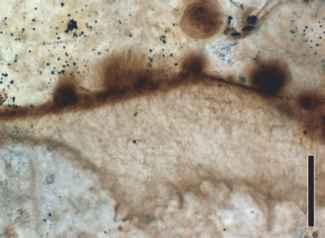 FIGURE 3.115 Elongated tuft-like colonies of Croftalania venusta (Devonian). Bar = 500 pm. 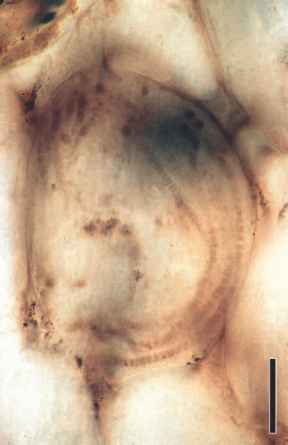 FIGURE 3.116 Microbial mat formed by Croftalania venusta (Devonian). Bar = 500pm. 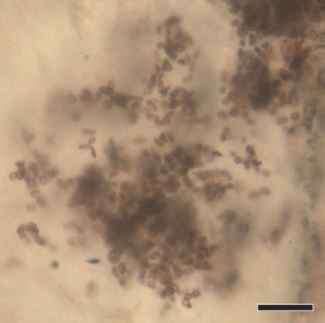 FIGURE 3.117 Spiny spheres (probably peronosporomycete oogonia) that are associated with the microbial mats formed of Croftalania venusta. Bar = 25 pm. are spiny spheres that may represent peronosporomycete oogonia or some other microbial reproductive structure (FIG. 3.117). The Rhyme chert also provides the earliest fossil evidence for endophytic cyanobacteria in land plants in the form of Archaeothrix-type filaments that colonize prostrate axes of the land plant Aglaophyton major (Taylor and Krings, 2005). 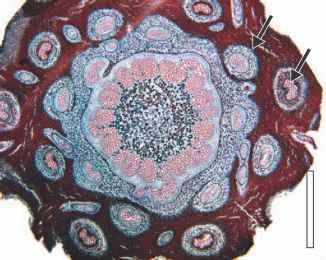 The cyanobacteria enter the axes through stomata and initially colonize the substomatal chambers, some also occur in voids of degrading sporangia of Aglaophyton. From the substomatal chambers they spread through the outer cortex and individual filaments or groups of filaments penetrate cortical cells to form coils (FIG. 3.118). FIGURE 3.118 Coils of cyanobacteria inside Aglaophyton cell (Devonian). Bar = 50|im. is a delicate envelope. Comparisons with living cyanobacteria suggest that the various morphologic types assigned to S. variabilis represent different stages in the life cycle of a single organism. Accordingly, the larger masses represent endosporangia that contain endospores, and some of the other cells represent stages in the vegetative plant body.